When Belmond La Residencia, the gorgeous hotel across from the Charles Marlow offices in Deià, opens mid-March, it always signals to us that another life-affirming season in the village is truly underway. In its own elegantly bohemian way, Belmond La Residencia is a major cultural force in Deià, the West Coast of Mallorca and throughout the island. This is partly due to its unique history. 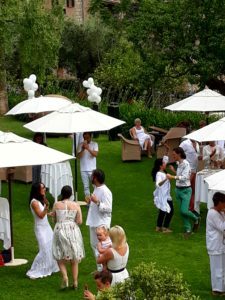 But it’s also a result of the care and attention the hotel puts into creating a season-long programme of events that brings guests and villagers together to enjoy everything that makes life in our part of the world so enriching. Belmond La Residencia has played an enormous part in helping Deià become known as the artists’ village. 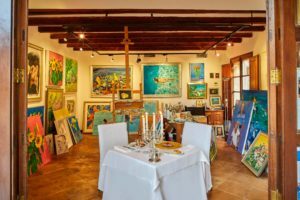 From April to October, shows at the charming Sa Tafona Gallery feature different local artists working in a diversity of styles but sharing a certain sensibility. The Spring Collective runs from 19 April to 8 May and is a great introduction to the work of local and visiting artists. 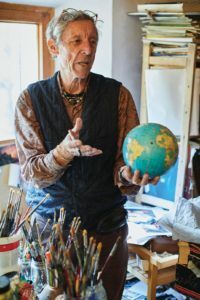 After this, there will be shows by local favourites David Templeton, Manuella Hollo and Arturo Rhodes as well as other artists well worth discovering. We suggest you make a mental note to drop in to Sa Tafona regularly. This year, the Bi-Annual George Sheridan Painting Prize Collective exhibition will also take place, curated by artist Cecilie Sheridan, George’s widow. It will run from 6 to 25 September. Cecilie will continue to offer guests her highly popular artistic Walk and Talk tours of the village which include visits to the artists who have helped create Deià’s reputation as a mecca for art-lovers. The hotel has added to its choice of art-related activities by introducing plein air outdoor classes above breathtaking Cala Deià with local artist Manuella Hollo, fast building a reputation for her colourful, very Mediterranean work. Another exciting innovation is Art and Dine evenings. These will take the form of a culinary journey through the hotel, leading people who take part past the hotel’s most striking artworks. Exquisite food and drink is served at every stop. The evening begins with a cocktail created by the hotel’s Café Miro, and includes an amuse-bouche served on the Steinway piano at Sa Tafona, as well as a starter in front of one of local artist Arturo Rhodes best paintings. This is followed by a colourful main course in the studio of Alan Hydes, one of the hotel’s artists in residence. The evening finishes with a truly surprising dessert prepared by prepared by head chef and culinary artist Guillermo Mendéz and a digestif on the moonlit terrace. Music born in warmer climes always sounds better in Deià, especially under the stars. This year, Belmond La Residencia is celebrating the sounds of jazz, soul and Latin music from Brazil and Cuba. The season kicks off on Friday 26 April with a concert by Nayla Yenquis, five musicians marinated in a mix of samba, bossa nova and modern jazz. It concludes on 6 September with an evening of intriguing opera pop by soprano Carme Gari and cellist Biel Fiol AKA Viocello. On 6 June, the Deià Chamber Players perform on the hotel lawn on 6 June. The concert is to support the Vicente Ferrer Foundation, a long-time hotel favourite. Later in June, the afternoon Garden Party will bring a refined British touch to the hotel’s ambience. Attendees are asked to dress in white. Classical finger food with a twist will be served alongside a refreshing range of delicious drinks. Singer Paul Martin will provide entertainment. On the night 2 August, rockin’ Deià favourites the Pa amb oli Band will pound out their own particular brand of rock and roll way into the night. Guests, villagers and aficionados will boogie together under the stars. Elsewhere in the village, you’ll be able to savour contemporary Brazilian sounds with the Jon Cilveti Band at Hotel d’es Puig in May. The All Souls Band will pay tribute to the first lady of soul Aretha Franklin at Anfiteatro de Deià in July. In August, at the same venue, Isis ‘Apache’ Montero will get you grooving to Latin jazz. With so much happening, it’s no wonder Ulisses Marreiros, General Manager at Belmond La Residencia is looking forward to 2019 at the hotel. ‘The numbers we have on the books are very promising,’ he says, ‘and there are so many exciting events and happenings taking place this year on top of the new, mostly art-related, activities we’re offering’. If you’d like to know more about all art-related activities at Belmond La Residencia or want to make sure you don’t miss any of the events at the hotel, please contact hanna.bornebusch@belmond.com.